There are 10 days left to enter! 20 years ago, Joanne Harris’ multi-million-copy bestselling novel Chocolat captured the hearts of millions of readers the world over. 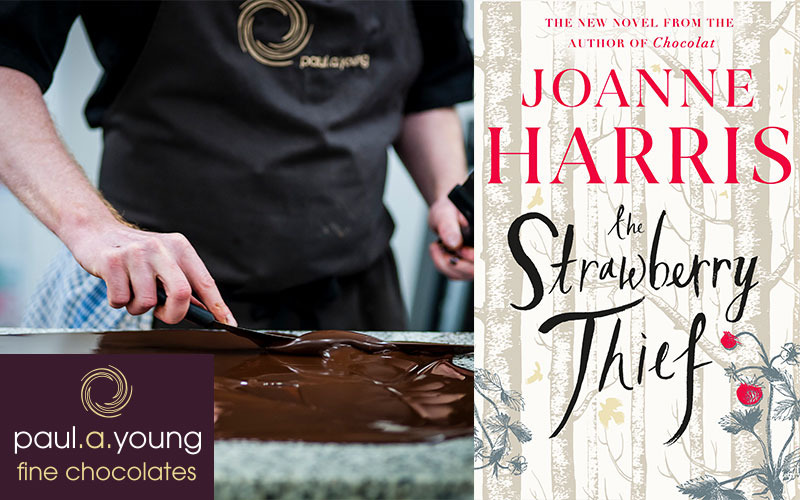 Now, readers are being invited to return to the world of Chocolat and the French village of Lansquenet-sous-Tannes in her stunning and highly anticipated new book The Strawberry Thief – out now in all good bookshops. To celebrate the release, we’re offering you the chance to win 2 places on a luxury Chocolate Tasting and Making masterclass at top award-winning chocolaterie, paul.a.young fine chocolates, in London on Saturday May 11th 2019. The lucky winner will also receive a hardback copy of The Strawberry Thief! Join the paul.a.young team in their kitchen for one of their popular Tasting & Making workshops, as they share some of the essential skills of making fresh, handmade fine chocolates. The day begins with an introduction to paul.a.young and what makes them so unique in the chocolate world. Then begins a vertical chocolate tasting from the bean through some of the world’s finest bean to bar producers and cocoa bean varieties. The hands on section of the day begins with a ganache masterclass teaching you how to create a silky, smooth ganache with some very unexpected ingredients and a demonstration by a skilled chocolatier of marble slab tempering. Truffle shells, filling, rolling, coating and decorating – they will show you all the tricks of the trade to make your truffles stand out in the crowd, from simple piping designs to artistic decorations.